As I walk through the entrance to the city my eyes widen. It's much different from Oceana; from the land scape to the buildings.Well Rain should we start looking for Kuroi. Rain nods and cries out in excitement. I begin walking around looking for anyone who has a water type pokemon with them. Kuroi walked the city finally before sitting on the bench as Ace jumped down from his head and sat on his lap. He stroked Ace's head as he watched the people walk from the city. Ace turned around in Kuroi's lap and watched the people with him. "We will need to challenge the gym leader soon." He felt Ace nod in approval with him. Just then i saw someone sitting on a bench with a totodile sitting on their lap. I walked closer to them then came to realize that the person sitting there was Kuroi. My eyes widened as i ran towards him yelling his name excitedly.KURO!....BIG BRO KURO!! Kuroi looked up at the kid who was approaching him. He had a grin on his face as he realized it was his younger brother appproaching him. He stood up to approach him as Ace jumped up onto his head. "Well if it is not my younger brother Sora. I see mom has finally let you out of the house." Kuroi let out a small laugh as Ace eyed Mudkip. I pucker my lips.Pssh when i found out you were leaving there was nothing that could stop me. Rain stares at Totodile and begins speaking to him. I laugh at Rain.Oh yeah you never meet him this is Rain. I say to Kuroi pointing at the Mudkip on my shoulder. "That is nice to know." Kuroi looked up at Rain on Sora's shoulder. Kuroi was happy that his love for water pokemon also had an effect on his younger brother. "Ahh I see you fell in love with the water types as well." Seeing his brother with a water type pokemon brought a smile to his face. He did want to see how strong Rain was. Yea i guess you rubbed off on me. I say smiling. I began wondering how strong Ace was.Hey how about a little battle. I say knowing i would lose. "I am glad that something rubbed off on you." Kuroi stood there thinking for a moment. But Ace already had the answer for Kuroi thoughts. He jumped down in front of Kuroi and started trying to show off his muscles. Kuroi let out a small laugh. "Guess Ace says yes." Rain jumps down and stares at Ace ready to battle. Smiling i laugh at Ace.Feisty one isn't he....Anyway you ready Rain? Rain nods and gets into his battle stance. "Yeah he is. Ace use Water Gun" Ace nodded and unleased a blast of water at Rain. 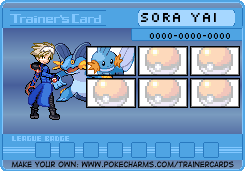 Kuroi was going to show who the better water trainer was to his brother. He did not just want to show his brother who was the better water trainer but how much Kuroi had grown since leaving Oceana City. While Ace fired the Water Gun; Kuroi was building a strategy for his brother. Rain brace yourself! Rain put his head down and braced for impact, as the water gun hit Rain slid back 2 feet and looked back up.Good Job Rain!....Now you Tackle. Rain nods and lunges at Ace. Sora was determined to show that he wasn't just a little brother and he could stand on his own. Ace watched as Rain braced itself from taking a Water Gun head on. Ace jumped on his right foot then his left one but then stopped as Rain started charging towards him. "Water Gun" Ace fired another Water Gun at Rain trying to steer him off course and hopefully knock him back. Kuroi just smiled at his brother battling him. I smirked as Ace fired another water gun. Now Rain jump and use tackle again. In mid charge Rain nods and jumps in the air/He then turns his body and dives straight at Ace not giving him much time to counter of dodge. Ace watched as Rain jumped over the Water Gun and charged at him. Ace fell back from the impact of the Tackle. Kuroi nodded and let Ace handle this one. "Ice Fang!" Ace fangs grey icy as he stood to his feet and tried to bite Rain. He was growing proud of his brother each minute. Rain watched as the Ice Fangs grew. I tried to call out for him to dodge but it was to late. The attack hit its mark. Rain closed his eyes tight before i called out another command.Rain use growl. Rain's eyes snap open as he let's out a ferocious growl in an attempt to lower Ace's attack. Ace Ice Fang lost some of its power after being hit with the growl. Ace just shook his head and backed away from Rain waiting for its next move. Kuroi stood there for a second plotting about what he should do. Finally after five seconds Kuroi had an idea about what to do. "Water Gun!" Ace opened its mouth and fired another Water Gun at Rain. I was a bit puzzled by Kuro's actions. Rain dodge and use tackle. Rain barrel rolls out of the way and charges at Ace again.Kuro i know your up to something. I yell out not sure knowing what though. Kuroi had baited Rain into his trap. "Yes I am now watch. Ace use Water Gun then use Ice Fang on the Water Gun to freeze and form a small shield in front of you." Ace shot a Water Gun at Rain then his fangs grew Icy as he bit down on the Water Gun causing it to freeze in front of him. It formed a small shield in front of Ace as Ace bounced on his feet waiting for Rain's next action. Rain slammed head first into the shield. He cringed slightly. I frowned by Kuro's attack. Rain bust right through it. Rain cryed out in conformation as he started cracking the ice.Don't let up! Use Tackle and Bust Through It!!!! I say with passion. Kuroi had a grin on his face as his brother tried to breakthrough the shield. As he died; Kuroi already had a plan for him. Ace hand glowed silver as he knew what Kuroi was thinking. "Slash!" Ace charged at the broken Ice and slashed upwards at Rain. If this did not work Kuroi had another plan in mind. I smirked at Ace rushing in on Rain.Now Rain dodge use his momentum against him and use Tackle! I call out to Rain. Rain jumps to the left then lunges at Ace. Ace turned his head as Rain smacked into him sending him flying. Ace hit the ground rolling before coming to a stop. Kuroi wanted to intervene but he would let Ace decide what he would do. Kuroi turned his head and looked as Ace staggered to his feet before standing up straight. Kuroi smiled at the spirit that his pokemon shared with him. "Do you want to keep going?" Ace took his time walking back towards Rain. EDIT: Eon: Do not make any OoC posts in the in-character thread. If you have to say that you can't post, do in on the OoC boards or by PMs. Do not make any edits to this post. Make your next post as a separate post and I will delete this post when your next post is done.